BBC News - What is the Order of Merit? What is the Order of Merit? When Sir James Black passed away this week he left a vacancy in the Order of Merit - the so-called "most exclusive club in the world". But what is it and what makes it so special? Sir James Black invented beta-blocker drugs, won a Nobel Prize and is widely hailed as one of the great Scottish scientists of the 20th Century. But tucked away in his biography is a lesser-known accolade. 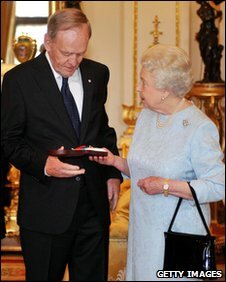 In 2000, Sir James was given what's often called "the UK's highest honour" - the Order of Merit (OM). The medal is compared to France's Legion d'honneur and America's Congressional Gold Medal, but with one big difference. Most people in France and the US have heard of their country's honour, while over here most people have no idea what the Order of Merit is. This has a lot to do with the arithmetic, says Stanley Martin, a former diplomat who has written a book on the honour. At any point in time, there can only be a total of 24 members of the OM. This has been the case since King Edward VII established it in 1902 to reward those whose accomplishments in the arts, sciences and learning may go unsung. Also, the honour does not come with a title, so there's no immediately obvious way of knowing someone has been bestowed with it. 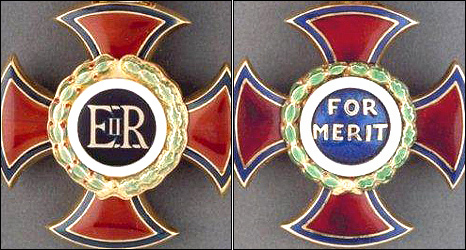 Members are given a red and blue enamel badge, which reads "For Merit". When a member dies the badge is returned to the Queen, who receives the next-of-kin personally. She also has a portrait painted of each member, which becomes part of the royal collection, and hosts a gathering for the entire Order every five years. It's thought the number of members is so small to keep it exclusive. "That was the number deemed to be exclusive enough," says a Buckingham Palace spokesperson. Mr Martin says the ratio of knights and dames to OMs is 150 to one. "Knights and dames are ten-a-penny," he says. "[The Order of Merit] is extremely exclusive. They are the names of the 20th Century." People who have been awarded the honour include Florence Nightingale - who was the first woman - TS Eliot and Sir Winston Churchill. There have been 11 honorary members from foreign countries, like Mother Teresa and Nelson Mandela. Although nearly all prime ministers of the 20th Century have been knighted, only six of the 20 received the OM. Lady Thatcher is a member of the current group. Although there is some attempt to keep a balance between different disciplines, royal experts say the OM isn't about meeting quotas. "It's absolutely earned by the individual every time," says Hugo Vickers, a royal biographer. "There's nothing automatic about it at all." Mr Martin says the Queen's advisers believe it's better to have multiple members who are outstanding in the same discipline, than to have mediocre members from varied fields. What also makes the OM special is that it is a "personal gift of the sovereign". It is awarded without any ministerial input; the decision rests squarely with the Queen. Her personal secretary receives suggestions from people and current members of the OM, according to Mr Martin. She then makes a decision. "It's an elite award, but nevertheless it's been fairly meritocratic," he says. Sir Michael Atiyah, a mathematician and former president of the Royal Society, was awarded the OM in 1992. He recognises that members are not often well-known among the general public. But for him the honour is about getting respect from his peers. "It's not like being a pop star," he says. "I'm quite happy with modest fame and notoriety amongst people I respect." Mr Martin says the public's ignorance of the OM may be because it doesn't come with a title. The majority of knights and dames aren't famous, but the title gives them an air of importance. "Our society is so hidebound with our obsession with titles," he says. "For anything to be worth anything, it must have a title." But Mr Vickers points out that the OM is "more intellectual than a more worldly honour". Lucian Freud famously turned down a knighthood but accepted the OM. "It appeals to intellectuals, those who don't want to be 'Sir Somebody'," he says. "It just means fantastic achievement at a very high and special level." Not everyone is of the same opinion. There have been a few notable deferrers, including Rudyard Kipling, who turned it down twice. 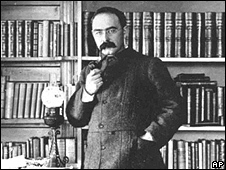 Kipling believed it wasn't right for him to take an honour from the state, says Mr Martin. The death of Sir James leaves a vacancy, but who will be the next recipient is not yet known.